Trains are probably the most comfortable and reliable means of transportation in Morocco. There are basically two major lines: from Tangier (northern Morocco) travelling south to Sidi Kacem then Marrakesh, and from Oujda (northeast) also travelling to Sidi Kacem and Marrakesh. The ONCF, which is Morocco's national railway company, provides information on their schedules and fares at ONCF (translated from French by Google). There are two categories of trains: The first is the Express Trains (TNR) which is used to describe not only a fast transport, but one with the minimal of creature comforts. The train departs every 30 minutes going from the Mohammed V Airport in Casablanca to Rabat, for example. These fares are roughly 30% higher than coach. 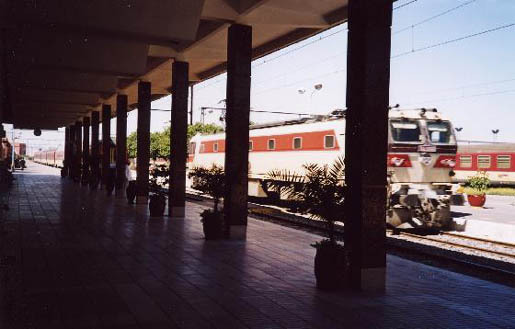 The second are the Air-conditioned Trains, which have the longest transportation line covering these destinations: Put, Féz, Oujda, Tangier, and Marrakesh. These trains are designed to make even the longest of rides comfortable featuring air-conditioning, cozy seats, wiring for sound, freedom to move about, large windows for panoramic views, and medical staff. Tickets only come in two class distinctions, first-class and coach, or second-class. Second-class seats are extremely reasonable, costing a bit more than bus travel in town. There are "couchettes" available on the night trains from Tangier-Marrakesh and Tangier-Oujda which are about $5.50 extra. Since passengers are locked in their carriages, and there are guards at night, this extra amount is well worth it from a security point of view. If trains are expected to be your main mode of transportation, consider buying a freedom pass since this will give you 3-5 days of free travel on the Moroccan train, as well as allowing you to travel about Europe. RailEurope's web site is: http://www.raileurope.com/us/rail/passes/eurail_saverpass.htm.